Kaleden, B.C.—Working with wheat farmers on Canada’s prairies, agronomist Ken Sapsford of the University of Saskatchewan is no stranger to herbicide resistance in grains. The use of broad-spectrum herbicides such as glyphosate—best known as Monsanto’s Roundup, though it exists in 22 other formulations—is so widespread that Monsanto has developed Roundup Ready hybrids of some crops to facilitate its use. But weeds have followed suit, with 28 species worldwide exhibiting resistance to the chemical. Roundup is simply no longer able to corral them. Some of those species are common in British Columbia’s Okanagan Valley, where Sapsford and his wife bought a 2.5-acre vineyard in 2013. Kochia (Kochia scoparia), Canada fleabane (Conyza canadensis), and both common and giant ragweed (Ambrosia artemisiifolia and Ambrosia trifida, respectively) are four resistant species resident in Canada; and of these, kochia and Canada Fleabane are present in the Okanagan. While glyphosate resistance hasn’t yet been observed in local populations of the weeds, Sapsford said that’s no reason for complacence; in fact, the weeds are ideal candidates for developing glyphosate resistance. Typically found on open, bare ground, these resistant species adapt well to hardy conditions with low competitive pressure. Roundup weakens them, but there are no competitors in these environments that can leverage that weakness to overtake the weeds. And so the weeds thrive. This makes kochia and Canada fleabane especially problematic in vineyards, where they’re often found on bare soil within the rows. The canopy doesn’t shade them, giving them the light needed for photosynthesis in an environment with little competitive pressure. This is where Roundup comes into play, keeping the vineyard floor clean and reducing competition for resources such as water. Glyphosate doesn’t impact the vine as long as the spray doesn’t touch the leaves, Sapsford said, leading grapegrowers to apply it at rates of as much as five to seven liters (1,800 to 2,500 grams acid equivalent) per acre. By comparison, grain growers apply glyphosate at rates closer to 1 litre (360 grams acid equivalent of glyphosate) per acre. But just because a regular dose of glyphosate does a good job doesn’t mean a stronger dose will do a better job, Sapsford said. Rather, it ultimately inures the weed to the herbicide. Kochia responds by producing more of the protein that Roundup attacks, frustrating the action of the herbicide, while Canada fleabane increases efforts to isolate the glyphosate, preventing it from moving to where it can take effect. “Plants have developed different resistance mechanisms such as reduced translocation, isolation of (the) herbicide and gene amplification to develop resistance to glyphosate,” Sapsford explained. A smarter approach to weed control is combining herbicides to broaden the challenges weeds face. Rather than battling one kind of poison, a species will face two herbicides with different modes of action. The double-headed challenge makes it harder for the weed to adapt to either one successfully. “Glyphosate has made it very easy to control the weeds under the vine. But easy is not always the answer, good management is required to avoid resistance,” Sapsford said. Sapsford’s vineyard manager, Pierre Levesque of Earlco Vineyards Ltd. in Penticton, B.C., says his work for Sapsford has heightened his attention to signs of emerging glyphosate resistance among weeds in the approximately 130 acres of vineyard he oversees in the southern Okanagan, primarily along the Naramata Bench. “I have a feeling that people are using too high a dosage of glyphosate,” he said, acknowledging that even he has been using too much—2.5% versus a recommended rate of 1.5%. Levesque is now combining herbicides from different groups. Glyphosate, a Group 9 herbicide inhibits amino acid synthesis, but Levesque combines it with Chateau, a moisture-activated herbicide belonging to Group 14, which inhibits a chlorophyll enzyme. It kills the seeds of weeds, preventing them from returning after mowing. Earlco has also invested in a Fischer GmbH mower that mows within the rows, between the vines, and is able to apply a focussed spray to the area around the trunks to ensure thorough, and targeted, suppression of weeds. But if glyphosate resistance is becoming an issue of greater concern, Brad Hanson, cooperative extension weed specialist for vineyards and orchards in the Department of Plant Sciences at UC Davis, told Wines & Vines that it hasn’t become one that’s taking an economic toll on West Coast growers. Rather, it stands to increase management headaches and costs more than anything else. But with competition for water a significant issue in California right now, weed control is attracting greater interest. 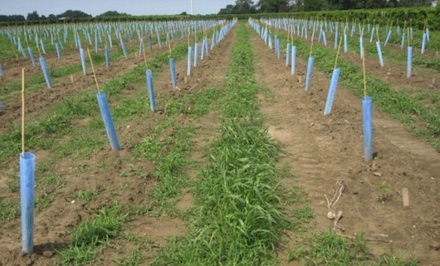 Knowing how control weeds without making them stronger makes it important that growers follow good management practices when they go about conserving water. Back in the Okanagan, Sapsford will continue work towards that, discussing his findings with local agronomists. He spoke at a professional development event this past March, and will also address a workshop at the University of British Columbia’s campus in the Okanagan in September. Horticultural vinegar. Black plastic tarps. Mulch. Goats. Sheep. Rototillers. Any of these has to be better than soaking the ground with poison. Having seen how nice vineyards look that have not seen any herbicides, but where the soil is merely being worked regularly so as to eliminate any unwanted herbs, which at the same time forces the roots to go deeper into the soil since they cannot extend laterally, I really get more and more convinced that using herbicides like roundup is not the right way in the field of winemaking. ...a worthy piece, but consider that a much more deadly herbicide is in the wings to take on glyphosate resistant weeds : 2,4-D...Dow Chemical is in the process of developing a family of seeds resistant to this old weed killer. If those products lead to wider use of 2,4-D in and around vineyards the resultant drift damage will likely dwarf that done by glyphosate to date. Having managed vineyards that have used both approaches, I would say that a diverse approach is the best method coupled with good timing. Using under-row ground cultivation costs labor and fuel (larger carbon foot print). You can spray two rows at one time and can only cultivate 1/2 row at one time (grape hoe and a disc). Unless you are farming completely flat, in which case its one for one, and isn't the case for most of us. Based on the current pricing for the generic Glyphosate it would be about 40% cheaper, use significantly less fuel and accumulate less equipment hours (related to maintenance /replacement costs and equipment downtime). As fuel and labor are more of a sustainability concern. Spray and cultivation timing and misapplication by personnel can be the difference between the right action and remedial action. Stay focused. Mitigating water use in the vineyard in the first place is also an applicable tactic. If we have appropriate actionable data about WHEN to turn the water on and for how long, we can go a long way to starving out the shallow roots of most weeds. Roundup is not benign. It does not always break down in a day or two like Monsanto says. When used repeatedly in vineyards it may never completely break down. Grapes metabolize whatever is in their environment. Remember the smoke tainted grapes of 2008? The extra cost of cultivating, even by hand, is preferable to poisoning ourselves with herbicide. I think if Monsanto was not so powerful Roundup would no longer be on the market. This bears watching but should have no surprise to anyone in the understanding of vineyard and land management. We must do more to protect the earth and ourselves from the over use (if any at all) of pesticides and herbicides.